This past Sunday was our quarterly Raise The Mark service where our church gathers for an extended time of prayer, praise, and proclamation of what God has been doing in and through our body. During our time together we asked people to break up into small groups and pray through the prayer guide that they received when they walked in. We realize that not everyone was able to be a part of our time together so we wanted to post the prayer guide for people to download, print off, and use as a reminder to pray. We hope you find it useful and we look forward to seeing you at our next Raise the Mark service. Click the link to download the prayer guide as a pdf. For those of you who where at Raise The Mark, leave a comment below with one take away from your time at Raise the Mark? 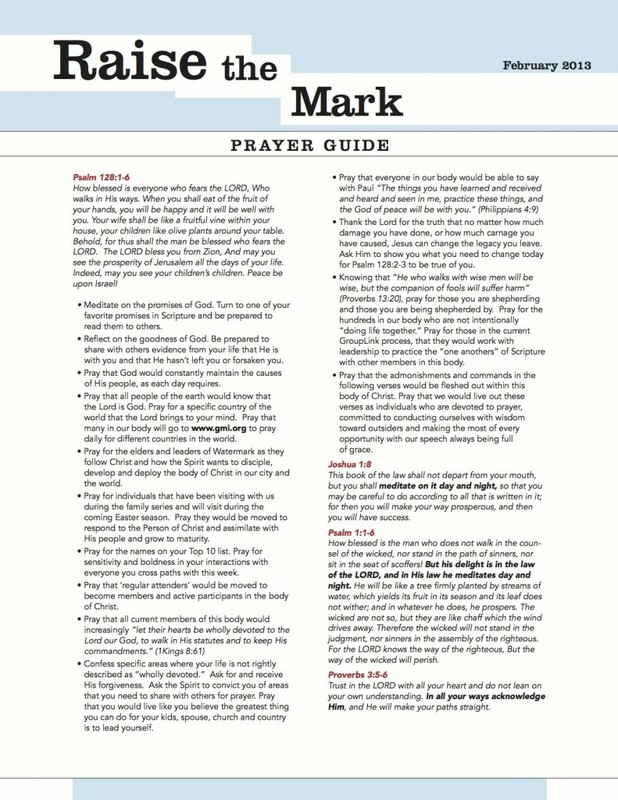 The post Download The Raise The Mark Prayer Guide From February 2013 appeared first on Watermark Community Church Blog.